Cost Containment partners with "green" pricing option supplier. Cost Containment International has announced that it is now promoting the sale of Green-e Energy certified renewable energy certificates (RECs). 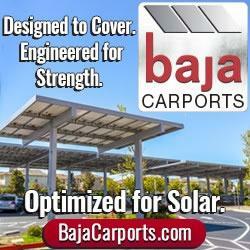 U.S. distributor secures deal for American-made solar panels. Innovative Solar Systems has become the #2 solar farm developer in North Carolina. The company has grown from developing 1 to 2MW size projects to current projects ranging from 20-100 Megawatts. Comet Solar begins installation of the largest commercial project permitted by the St. Kitts & Nevis Government to date. A prototype of India’s first floating solar power station could soon be coming up in the pond of Victoria Memorial. If the plan proves to be a success, such floating solar power stations could also be set up in the water reservoirs and dams of hydroelectric power stations thereby increasing their output. “Developing a floating solar power station would prove to be a revolutionary step as it could solve the perennial problem of land. Such pilot projects are also going on in a few countries such as France and Australia,” said SP Gon Choudhury, an international expert in solar energy and the brain behind this project. The idea is simple. A raft like platform fitted with hollow plastic or tin drums would be floating on water. The power generating equipment such as solar panels would be fitted on this raft so that they can float on water. It would not only solve the problem of land but would also help conserve water in the water bodies. The solar panels, which would be floating on water, would cut off the direct sunlight and hence slow down the rate of evaporation. “Studies have also shown that if the rear surface of solar panels are kept cooler, then their ability to generate power goes up by 16%. As these solar panels would be floating on water, they are expected to stay cool and hence we can generate more power than those set up on land,” Choudhury said.